Periprosthetic femoral fractures (PPFs) associated at or near a well-fixed femoral prostheses (Vancouver type-B1) present a clinical challenge due to the quality of the bone stock and instability of the fracture. 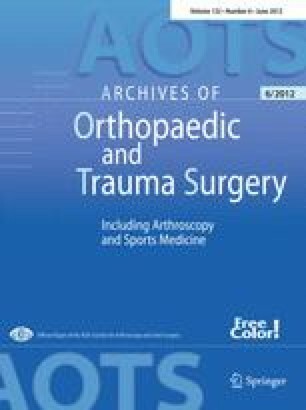 The purpose of this study was to present a novel reduction technique and analyze clinical and radiographic outcome in patients with Vancouver type-B1 fractures treated with percutaneous cerclage wiring for fracture reduction and maintenance of reduction with minimally invasive plate osteosynthesis (MIPO) utilizing a locking compression plate (LCP). Between March 2007 and December 2008, ten consecutive patients with spiral, oblique or wedge Vancouver type-B1 were treated with closed percutaneous cerclage wiring using a new cerclage passer instrument (Synthes®) through small 2–3 cm incisions for reduction and maintenance of reduction. Internal fixation with MIPO was obtained utilizing a long LCP Synthes® bridging the fracture. The reduction time, fixation time and operative time were recorded. The rehabilitation protocol consisted of partial weight bearing as tolerated. Clinical and radiographic outcomes included evidence of union, return to pre-injury mobility, and surgical complications were recorded. There were three men and seven women with an average age of 74 years (range 47–84 years) at the time the fracture occured. The average follow-up was 13.2 months. One patient died 2 months after surgery due to cardiovascular problems and was excluded. The average reduction time with percutaneous cerclage wiring was 24.4 min (range 7–45 min). The average fixation time was 79 min (range 53–100 min). The average operative time was 103 min (range 75–140 min). Blood loss was minimal and only two patients needed a blood transfusion. All fractures healed with a mean time to union of 18 weeks (range 16–20 weeks). There was one implant which bent 10° in the post-operative period but went on to heal uneventfully within 16 weeks. There was no evidence of loosening of any implants. Seven patients returned to their previous level of mobility. Two patients required a walker. There were no implant failures, wound complications or infections. Percutaneous reduction of spiral, oblique or wedge-type B1 PPFs with percutaneous cerclage wiring combined with minimally invasive locking plate osteosynthesis provided satisfactory reduction, adequate stability and healing in nine patients. Our early results suggest that this reduction technique and fixation may be a useful solution for this growing challenge in orthopaedics. The authors caution that this technique must be done carefully to avoid serious complications, e.g., vascular injury. No conflict of interest is present.